Problem-oriented participative forecasting is an autonomous and evolving concept. It aims not only to provide early signals of threats to development or to identify opportunities for development, but also articulate interest and mobilize different social groups to act in a manner conducive to the elemination of such threats and exploitation of such opportunities. This concept of the function of forecasting has major factual and methodological implications. 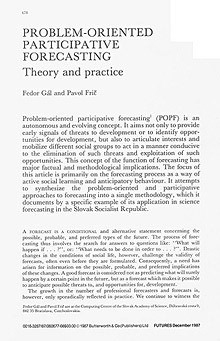 The focus of this article is primarily on the forecasting process as a way of active social learning and anticipatory behaviour. It attempts to synthesize the problem-oriented and participative approaches to forecasting into a single methodology, which it documents by a specific example of its application in science forecasting in the Slovak Socialist Republic. ČLÁNEK KE STAŽENÍ (PDF) – velikost je 3,1 MB.